It’s a case of art imitating life for Karl McGuckin these days. The Dungannon-born barrister is also a gifted singer who is increasingly in demand in the province’s theatres and concert halls. Karl (30) spends his days addressing judges and juries in the courtroom and his nights entertaining a different kind of audience. His busy life often finds him split between the two jobs, a little like his current theatrical role. 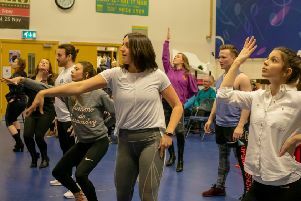 He is in rehearsal for Belfast Operatic Company’s production of the musical Jekyll and Hyde at the city’s Grand Opera House, a show in which he will play the title characters. While it is a musical and allows him to show off his powerful voice, it is also a complex acting role. It has led to director Wilfie Pyper and Karl coming up with various devices to portray the two sides of the main character in the show based on Robert Louis Stevenson’s famous story. Karl, who went to school at St Patrick’s College in Dungannon, trained as a singer with Veronica Dunne at the Royal Irish Academy of Music in Dublin while studying law at Trinity College. Jekyll and Hyde by prolific American composer Frank Wildhorn is an international musical theatre phenomenon. Jekyll and Hyde runs at the Grand Opera House from April 4-8. Tickets for Jekyll and Hyde are on sale now from the Grand Opera House Box Office on 028 9024 1919 or log onto the website www.goh.co.uk for further information or to book tickets.